The Chef's Table opened in November of 2015 and is located adjacent to Amici's, Chef David Dashi's award-winning homestyle Italian restaurant. It was Dashi's desire to both fill a need for a top-end steakhouse and also to open his kitchen to his patrons. Dashi has been doing just that: offering beautifully prepared Prime beef and seafood---with unique wines to match--- in an open-kitchen setting. His guests couldn't be happier. Begin your evening in the lounge with a glass of wine or a craft cocktail, then continue your experience in the dining room, where reservations are accepted for both table seating as well as the open-kitchen bar. One of the highlights of opening Chef’s Table was the opportunity to research and assemble a world-class wine cellar for our guests. The restaurant's extensive and unique collection is designed to offer value at any price point, housing classic selections, but also rare & older vintages as well as small-production wines from vineyards such as Nickel & Nickel, Cain Five, Cade, and Hall Wines. Knowledgeable staff are ready with suggestions whether you’d like to try something new or stay with tried-and-true favorites. 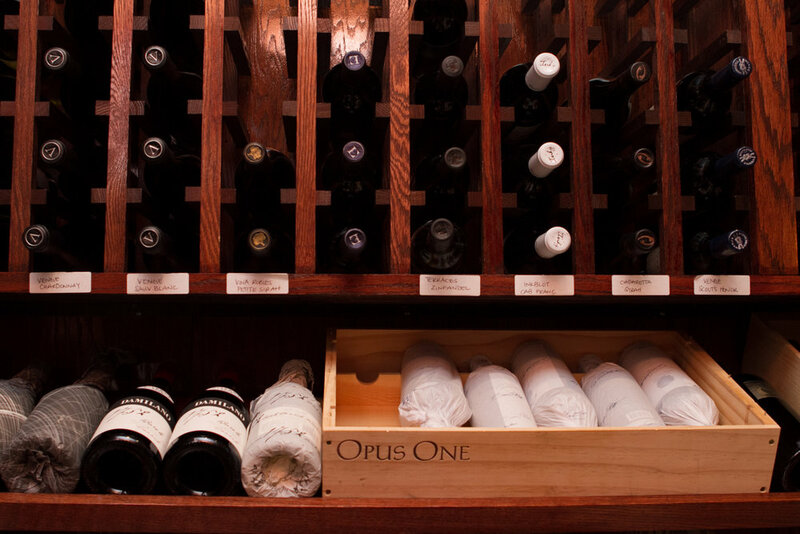 Click here to view our complete wine list. **Please note that pricing and availability are subject to change. JOIN US FOR OUR MONTHLY WINE DINNERS! Thank you. We look forward to seeing you at our next dinner! Coming soon... smaller tasting events for both wines and spirits! Topped with fresh mozzarella, black garlic & aioli, finished with candy caramelized onions and shiitake mushrooms. Served with honey and fresh blueberries. Tuna, crab, and avocado stack with sweet soy-ponzu mayonnaise. Templeton 4yr Rye Whiskey, Florentino Rosso Vermouth, Fee Bros. Aztec Chocolate, muddled black cherry. Banyon Reserve vodka, housemade ginger syrup, muddled orange & club soda, candied ginger skewer. Willet Small Batch Bourbon, housemade hibiscus syrup, Fee Bros. Old Fashioned Bitters, fresh orange & cherry. Hendrick's Gin, fresh lemon, housemade lavender syrup, champagne, lemon pinwheel. Corzo Anejo Tequila, fresh-squeezed citrus. Banyon Reserve Vodka, olive juice & tabasco, gorgonzola-stuffed olives. Patron XO Coffee Liqueur, Gran Marnier, Bailey's Irish Creme. Frangelico Hazelnut Liqueur, Molinetti Milk Chocolate Liqueur, fresh cappuccino. St. Germaine Elderflower Liqueur, housemade hibiscus syrup, champagne.